"What a lovely book - the Fish Book! Super photos, everything looking absolutely delicious." "Outlines everything you ever wanted to know about fish but were too afraid to ask...A good Christmas gift"
Georgina Campbell’s latest cookbook – and Ireland’s first ‘seafood bible’ – is ‘From Tide to Table’ - Everything You Ever Wanted to Know About Seafood. This stylish and user-friendly seafood cookbook is published in association with Bord Iascaigh Mhara (BIM), the Irish Sea Fisheries Board, who will donate its proceeds from sales of the book to the RNLI. Designed to help even the most reluctant of home cooks to feel comfortable shopping for, and cooking seafood, ‘From Tide to Table’ is a handsome hardback covering everything from nutritious easily prepared family meals to seafood dishes for special occasions, and is sure to be a very popular gift this Christmas. Much more than just a cookbook, ‘From Tide to Table’ is the first Irish cookbook to offer a complete user guide to buying, preparing and cooking the wide variety of fish and seafood caught in Irish waters. Seafood is enormously popular in restaurants, but home cooks often lack the confidence to serve it – this book demonstrates the ease of preparing and cooking seafood, and offers home cooks practical information and appealing, accessible, healthy seafood recipes for every occasion. The range of over 60 tantalising recipes is illustrated with specially commissioned photographs by acclaimed food photographer, Paul Sherwood, and includes some specialities contributed by BIM Seafood Circle members around the country. There are many popular dishes like ‘Luxury Seafood Chowder’, ‘Baked Crab Hotpot’ and ‘Smoked Salmon Tagliatelle with Parmesan Cream’, ideas for family and midweek meals like ‘Cheesy-Grilled Pollock’ and ‘Smoked Haddock Fish Cakes’, special occasion seafood such as ‘Sole on the Bone’ and ‘Whole Poached Salmon’, and a wide range of the side dishes, sauces and accompaniments to make every meal special. ‘From Tide to Table’ explains the health benefits of seafood and provides a detailed fish identification, shopping and preparation guide - and it also gives readers an insight into the Irish fishing industry: it includes information on responsible fishing methods and initiatives, also descriptive mini-features on the various species and how they are harvested and produced (including oyster cultivation, salmon smoking and mussel farming to name but a few), the sea and landscape that creates them, and some of the people who work with them, lending a unique personality to this beautifully illustrated book. So, if you like seafood but do not feel confident enough to cook it at home. 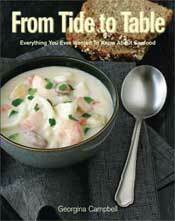 or if you are unsure of how to prepare or what to serve with seafood, than this is the book for you. Include ‘From Tide to Table’ on your Christmas wish list and enjoy cooking delicious Irish seafood meals for many years to come!